The image on the left is a wood engraving that was likely commissioned by a popular magazine hostile to abolitionism and happy to render Angelina strangely distorted. This is the first time that it has been published next to the photo on the right, on which it was based and which was likely taken in the 1840s. Left: Image courtesy of the Library of Congress Prints and Photographs Division. Right: Published in The American Magazine in an article by Ida Tarbell in 1910. Image courtesy of Louise W. Knight. Angelina Grimké’s future seemed clear the day she entered the world. Born a Southern aristocrat in Charleston, South Carolina in 1805, she was destined to become an enslaver; born female, she was destined to receive little formal education, have no profession, and pursue a life of domestic obscurity. Instead, she broke free. She left the South for Philadelphia in 1829 and by 1837 had become a famous lecturer and published author advocating for the end of slavery and for women’s rights. In researching a biography of the Grimké sisters, Angelina and her older sister Sarah, one of my challenges has been to explain how and why Angelina changed so much. How did she become one of the first American women to embrace a life of itinerant political activism and a brilliant orator whose speeches are still studied today? At first I was focused on the key inherited beliefs she rejected, but eventually I realized she held on to other beliefs, and that these too played a part in her transformation. One of her lifetime beliefs was the strong love she felt for her country. The daughter of an officer in the American Revolution and of a mother also devoted to the new nation, Grimké remained staunchly patriotic all her life. Like other radicals, she found the famous sentence in the Declaration of Independence, “All men are created equal,” to provide a fully American justification for ending slavery and racism. Christianity was another inherited belief that fed her radicalism. As a child, she rebelled against her family’s ritual-dominated Episcopalianism, but in her twenties she was caught up in the religious enthusiasms of the Second Great Awakening, a period when many Americans, inspired by powerful church sermons and religious revival meetings, became “born again” by accepting Christ as their savior. While many newly evangelical Christians interpreted the Gospel to justify slavery and women’s silence in church, Grimké’s deepening faith eventually led her to join the Society of Friends (Quakers), who believed that owning slaves was a sin and that women too could preach the message of God. Living as a Quaker in Philadelphia, Grimké learned the vocabulary of “rights” when she joined the city’s newly founded female antislavery society, and that stirred new ideas. She later wrote, “The investigation of the rights of the slave has led me to a better understanding of my own.” Knowing that, we can see why she once observed, “The rights of the slave and woman blend like the colors of the rainbow.” She was not saying that the enslaved and free women faced the same struggles but that the rights they sought were harmonically aligned in the same rainbow of human rights, the same claim of equality for all. Grimké’s relatively short career of intense national public activism—a time when she wrote three lengthy and influential pamphlets and gave more than 100 speeches—lasted a little less than two years. It began in September 1836, when the American Anti-Slavery Society accepted for publication her first abolitionist pamphlet, and ended in May 1838, when she gave her final abolitionist speech at a public meeting in Philadelphia—a speech that fully demonstrated how far she had travelled from the restricted, conservative life to which she had been born. It is this, her final abolitionist speech that has garnered the most attention from historians of women’s history, rhetoric scholars, and biographers. This is with good reason. Grimké was a gifted orator, and her last speech on slavery was a tour de force. That night she spoke to more than 3,000 people, mostly members of the public who had come to learn more about the immediate abolition movement. The event had been organized by abolitionists, men and women, some of whom had come to town for a national convention. The audience was about half female and half male; black and white people mingled together. Having such a racially integrated public event in Philadelphia was a radical accomplishment in itself, and thus an invitation for trouble. Located in a state that was bordered by the slave states of Maryland and Virginia, the city was full of Southerners—including many young men studying at the local medical school—as well as free African Americans, whose economic success irritated the Southerners. Philadelphia also had its share of wealthy merchants who did business with Southern plantation owners and shared their racist views—as indeed most white Americans did. These merchants were not going to praise slavery publicly, but they hated the abolitionists for treating black people as social equals and stirring up controversy. The building where the meeting was held, Pennsylvania Hall, perfectly embodied these tensions. The abolitionists had just built it, in an effort to protect their free speech rights in a town that would not rent them a hall or loan them a church to speak in. Its grand opening had taken place only two days before. Those who opposed the abolitionists’ work hated the building on sight. As the audience gathered in the hall that night, a crowd of mostly well-dressed young men, soon numbering some 3,000, gathered outside, armed with bricks and rocks. The night after Angelina’s speech, Pennsylvania Hall was burned by an angry mob. This painting was made soon after by John Casper Wild and printed by John T. Bowen. Courtesy of the Library Company of Philadelphia. She spoke of her firsthand knowledge of slavery. “I was brought up under its wing…I have never seen a happy slave.” But the crowd outside kept interrupting. Bricks were thrown against the windows; glass shattered. Bricks and shards would have fallen on the audience if the hall’s inside window shutters had not been closed to guard against just such a possibility. The crowd outside made more noise. As the audience, looking nervously around, began to talk and shift in their seats, Grimké reclaimed their attention by reframing the meaning of the moment. “All this disturbance is but evidence that our efforts [are working] or else the friends of slavery would not care for what we say or do,” she declared. Skillfully, she turned her opponents into props for her arguments. Even though the crowd outdoors seemed dangerous, the abolitionists did not abandon their public meeting. Two more women abolitionists spoke. Then white and black women, to demonstrate their solidarity in the face of the hostility of the crowd in the streets, walked out of the building in pairs, arm and arm, past thousands of jeering white men. 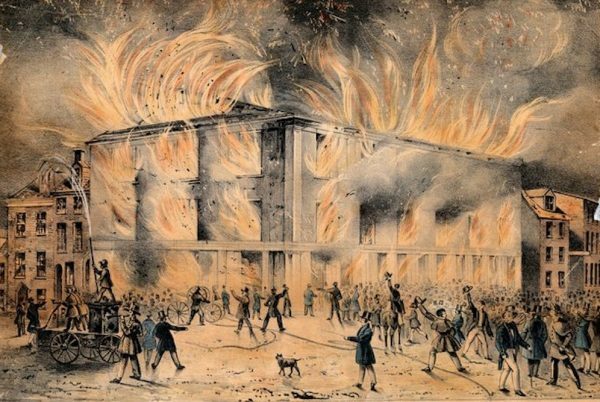 The next night, the mob returned and burned down Pennsylvania Hall while the fire department stood by and did nothing. The same week the hall was destroyed, Angelina Grimké married a fellow abolitionist and the couple settled down in Fort Lee, New Jersey, joined by Sarah. Angelina spent much of the rest of her life raising three children and teaching them and other children—first in a school the three ran in their house, and later in other schools. During the Civil War, however, she gave one last speech, this one in support of black soldiers, at a national gathering of women. Again she invoked, as she had in her abolitionist speeches and her writings about women’s rights, the Declaration of Independence’s inspiring claim. She called it “the very first national evidence of the great doctrine of brotherhood and equality.” Her observation conveys what her life so vividly illustrates: that while inherited beliefs can hold back progress, they can also advance it. Continuity and change are both needed to fuel a revolution, whether in an individual’s or a nation’s beliefs. Louise W. Knight is a Visiting Scholar in the Gender and Sexuality Studies Program at Northwestern University. She is the author of two biographies of Jane Addams and is writing a biography of the Grimké sisters.